I’m writing the first part two days into Cartagena and this city has swept me off its feet. Over the past few weeks when speaking of my upcoming trip to Colombia, I’ve been met with various reactions. Of course there’s the usual: “Are you sure it’s safe? Be careful, it’s dangerous, a lot of bad things happen there.” Inside I think “But that was years ago when Colombia was in the news a lot for the wrong reasons”. Now that I’ve been here….. Yes there are dangerous regions in Colombia, as Fernando, Carmen and many others tell me, but they are in the south east of Colombia where the climate and landscape is kind to growing Coca. 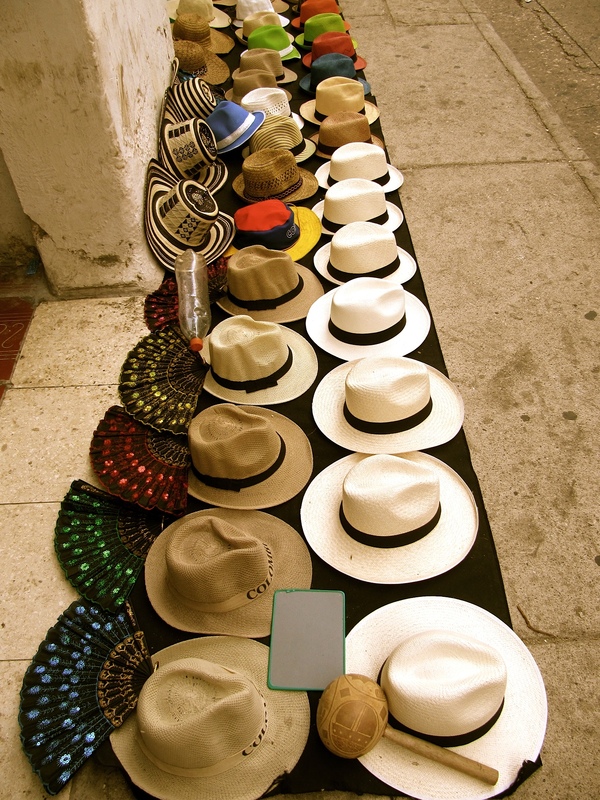 In Cartagena itself, as long as you don’t wander off to the unrecommended areas, you’re fine. It’s really down to being practical and cautious in any large city, just as you would in NYC, London, Philly, and avoiding the dangerous areas. I did not feel any less safer than I did living in Kuala Lumpur and Philadelphia. I’ve been traveling solo. I feel safe. The police and military are EVERYWHERE, in the city, on the highway, even in the Sierra Nevada mountain range. They are friendly and terribly cute when they smile. When visiting a new country, the thing that does it for me are the conversations & interactions with the locals. I’m thankful for Carmen who lives in a beautiful part of the old city. It is her home that was my base the first few days for exploring the old city. I’ve found a cute spot on the ancient walls (on the right of Cafe del Mar, for watching the sunset, listening to music, reading and people watching. Carmen is naturally funny as hell. She gave me an overview of how Catholicism is so ingrained in people’s lives here in Colombia. There’s a Saint that represents everything, e.g Santa Marta is the Saint to pray to for immigration matters, i.e. if you want your visa to US/UK/etc approved. Locals travel to the Santa Marta cathedral in Bogota on Tuesdays, and it’s packed and overflowing. You give your name to the priest who then reads out your name during service. And it’s literally hundreds of names. If you don’t get approved its because “god didn’t think the timing was right”. Carmen tells me a bunch of other hilarious stories like how sometimes the Chinese end up in Colombia on a boat, of course “by accident” (trying to make their way to USA) and because there are practically no Chinese living in Cartagena, they are sooner rather than later caught by the police and unfortunately sent back. I’m currently re-reading Marquez’s Love in the Time of Cholera, and Carmen’s stories of Colombia have helped me understand the Carteganian/Colombian nuances throughout the book. Fernando was sweeping the floors outside his shop on an early morning. I was searching for coffee, he read my mind, and asked if I wanted from Kaffe. YES Fernando! I’ve traversed the streets over and over again. I keep bumping into the same friendly people. Fernando whom I met at the San Pedro monastery, who shoved me into a free emerald tour and told me where to get local coffee. “Don’t go to Hard Rock Cafe!” he tells me. Don’t you worry Fernando, I would never step in there). Then there’s the guard outside of Parque de Bolivar who I’ve bumped into thrice now and has helped me find my way over and over again. He doesn’t speak a word of English, i don’t speak a word of Spanish, and yet we converse in utter confusion and laugh it off. And there are the others who want to help genuinely and ensure I’m having a good time. The Cartagenians are proud of their city, and it shows. I love the enthusiastic, passionate love they exude as I talk to them. During the time I was hiking in the Sierra Nevada mountains, I met a number of travelers who had been traveling for months throughout South America. I heard over and over again that Colombia was their favorite country because of the people and authenticity here. I’ve spent the last few days following the La Ciudad Perdida hike in Bocagrande, where I “splurged” at the Hilton. “Splurged” as in I really didn’t splurged, but had all these points I was able to redeem for a 2 night stay there. I initially had the impression that Bocagrande was going to be something like that horrific strip of hotels in Cancun, but I was wrong. The locals like to call it a Little Miami, and it’s also a residential area with great street food and ambience. I spent my last full day with Carmen’s friends and family by the bay, and the conversations have been hilarious, entertaining and educational. I came here for lunch with Carmen and Marcus, and the experience is like walking into Royal China (a damn good authentic dim sum place in London), I.e. filled with Colombians, hustling, bustling, with good food. 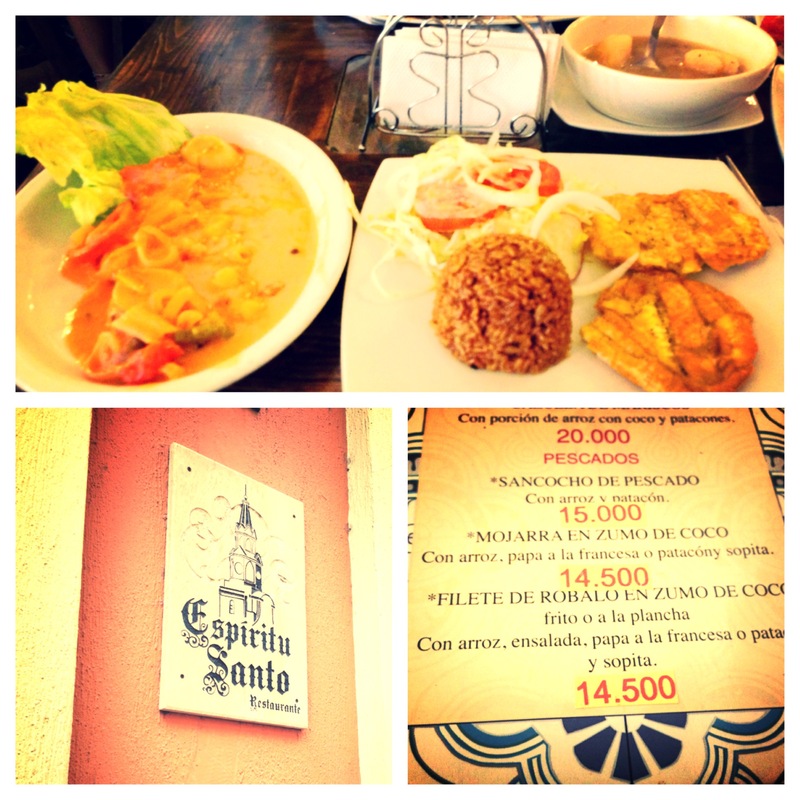 I ordered pescados de coco, fish in coconut sauce, which came with a soup, salad, rice and plantains. The portions are hearty and satisfying. As I finished my meal, Carmen goes “Wow I’m really proud of you!”. I beam at her and accept the compliment with pride. I’m pretty sure my stomach’s ability to expand during the right moments is something I’ve mastered as a Malaysian. We love food. 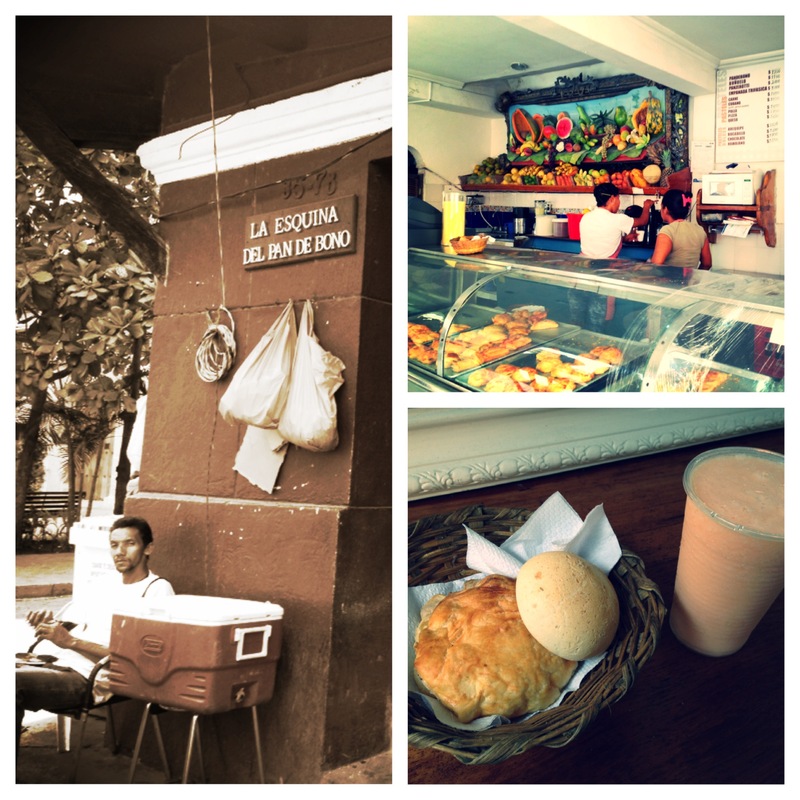 I’m glad Carmen recommended this bakery on the first day, because I’ve gone back everyday that I’m in Cartagena. I never know what I choose, and it’s a delightful experience biting into the pastry discovering its filling. Mmmmm. I love the round buns. They have this light frosting which tastes a bit like condensed milk, with butter and cheese in the middle. 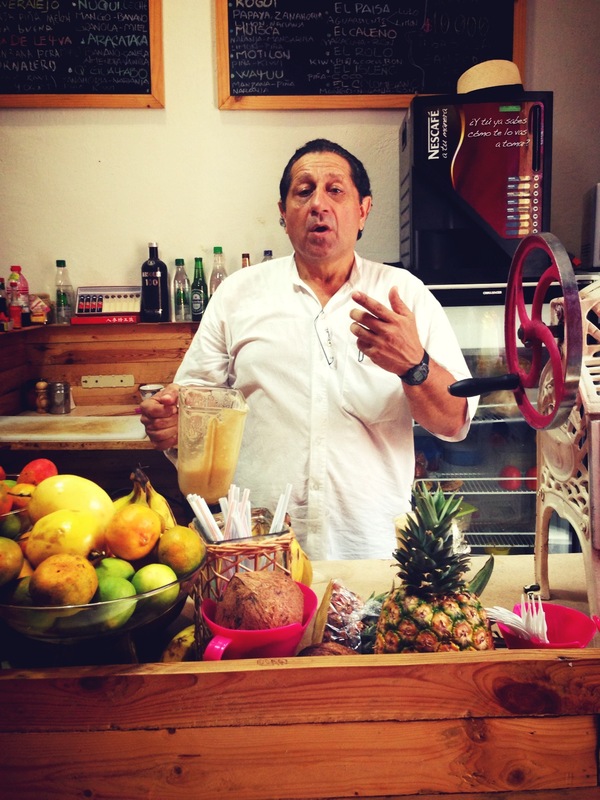 Their juices are pretty amazing too – lulo and melon are my favorites. 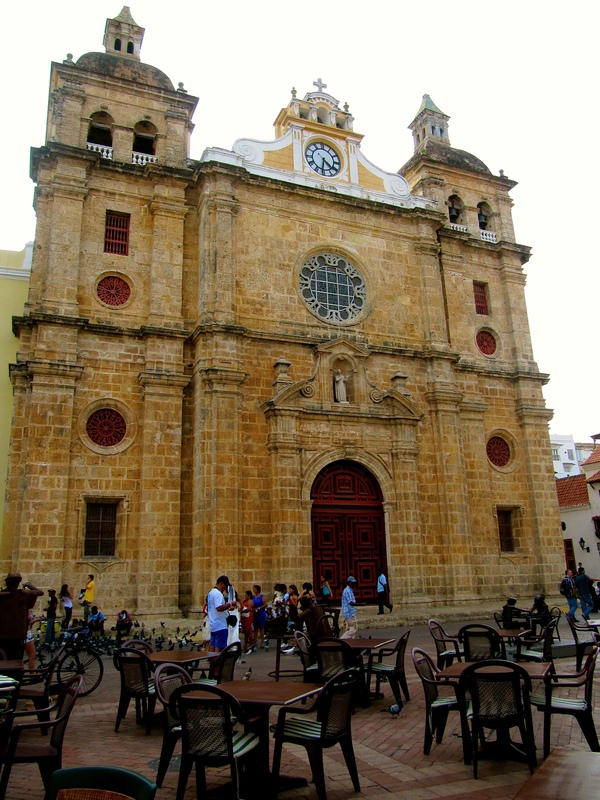 The bakery is opposite this cute little plaza in front of the Cartagena University. There are counters and bar stools which look out onto the bustling crossroads and great for people watching. Great tasty food. 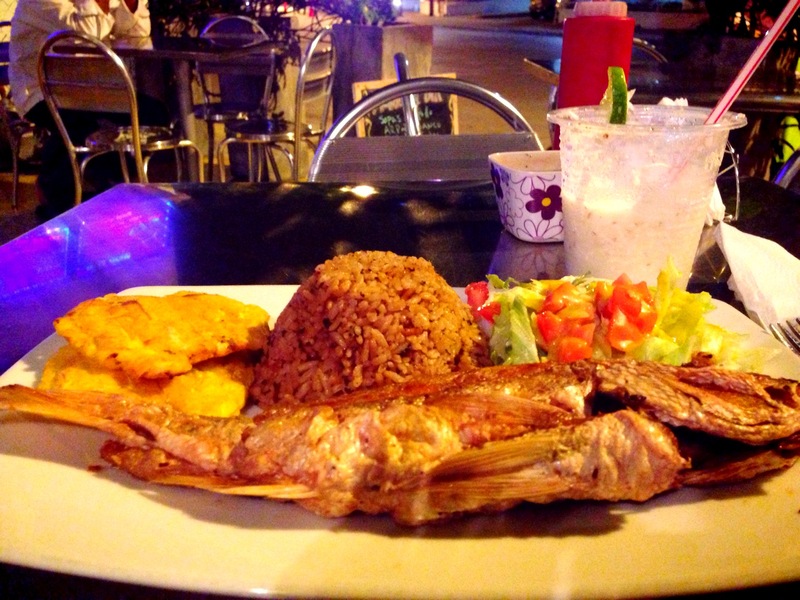 Ordered off the specials board: red snapper, coconut rice, plantains and salad. The coconut rice was particularly delicious. Got the limonada de coco as recommended by another reviewer and did not regret it. It came with shaved coconut on the top, and it was sooo refreshing.